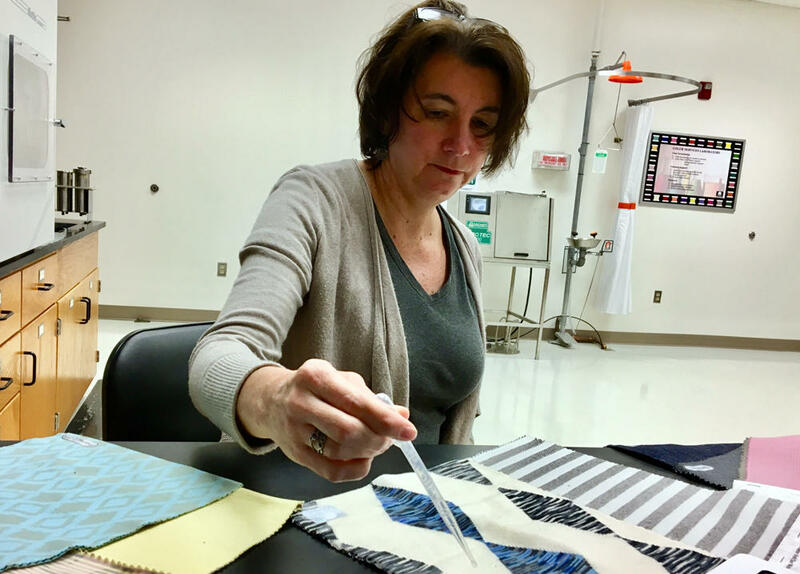 Mary Ankeny, Vice President of product development at Cotton Incorporated in Cary, NC, drops water on a fabric swatch. Cotton ready to be harvested in one of David Dunlow’s fields in mid-November. James Morrison reports on the causes of low cotton prices in recent years and the impact that's had on North Carolina cotton farmers. Low cotton prices and a couple of bad weather years have unseated North Carolina as one of the leading cotton-producing states. Traditionally ranked around 3rd or 4th, the state is now 8th in cotton production, according to USDA November projections. 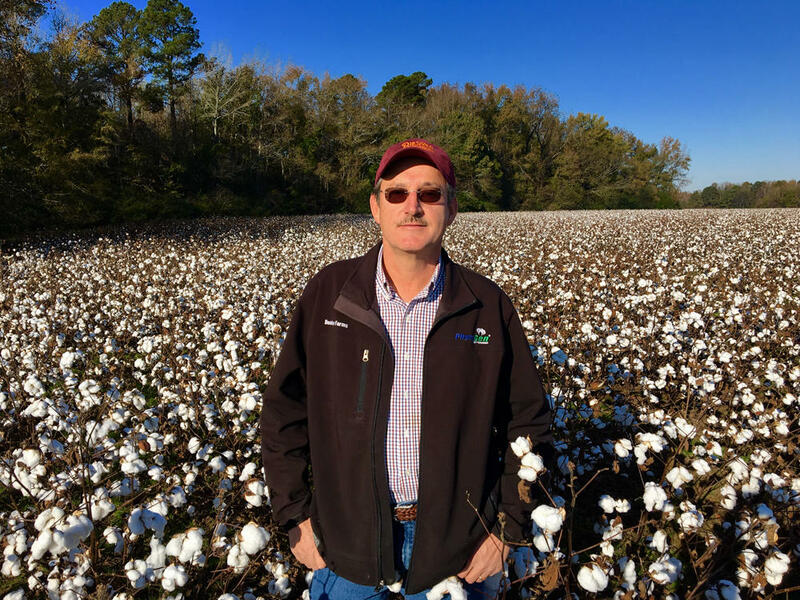 Longtime farmers like David Dunlow of Garysburg, North Carolina, are starting to wonder if it’s still worth growing cotton. That safety net he’s talking about is Title I of the federal Farm Bill. It’s a guarantee that the government will pay farmers if they suffer a crop failure or a major drop in prices. Congress took cotton out of Title I of the Farm Bill in 2014. And that left Dunlow without a safety net when rain nearly ruined his crop the following year. “Back in 2015, I think it was 17 straight days we had rain and clouds and misty rain. And then the temperatures were warm enough that the seed sprouted in the lint,” Dunlow said. NC Cotton farmer David Dunlow stands in one of his cotton fields outside Roanoke Rapids. That ruined the quality of the crop, and many North Carolina farmers were forced to sell their cotton at half market price. That was a devastating blow since cotton prices have been hovering around 70 cents a pound the past three years. That’s a third of what they were in 2011, when they peaked over $2 a pound. Farmers can blame Chinese government leaders for that steep drop in prices, according to John Robinson, an agriculture economist at Texas A&M University. 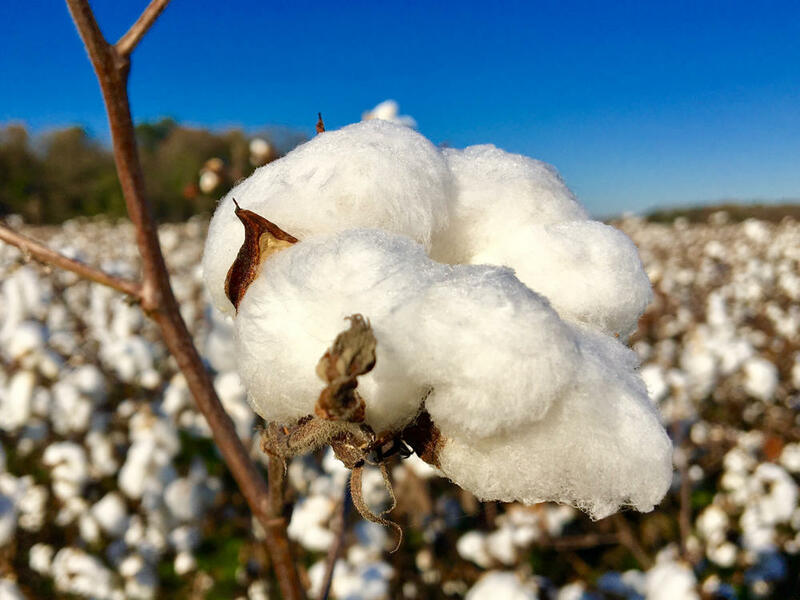 “Their response to that $2 a pound cotton in 2011 was to implement a government program of buying high-priced cotton and tucking it away in a government storage like the U.S. has for petroleum,” Robinson said. China held half the world’s cotton supply off the market for three years. But in 2014, it began dumping that reserve, depressing prices and killing the export market for American cotton growers. At the same time, yoga pants were becoming widely popular in America. 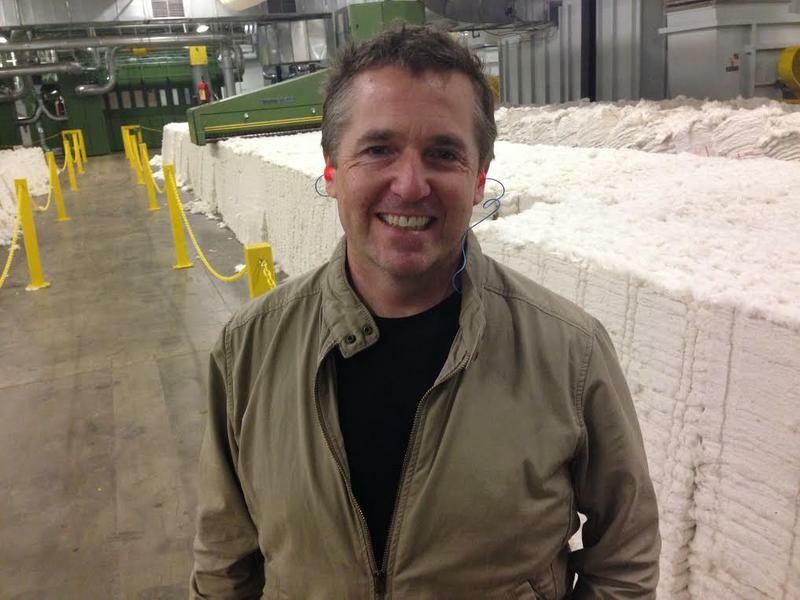 This new desire for synthetic athletic wear eroded demand for cotton, according to Robinson. “When these fashion things happen, all of the sudden, there will be a big shift - in this case inwards - in the demand for cotton, because it seems like everyone is wearing those tight clingy yoga pants, whether they should be or not, they are,” he said. Water spreads through the fibers of Cotton Inc.s new TransDRY fabric. But Cotton Incorporated in Cary, North Carolina, thinks it has a solution to the growing popularity of yoga pants. It has designed a new cotton fabric, called TransDRY, that breathes and wicks moisture like its synthetic competitor. 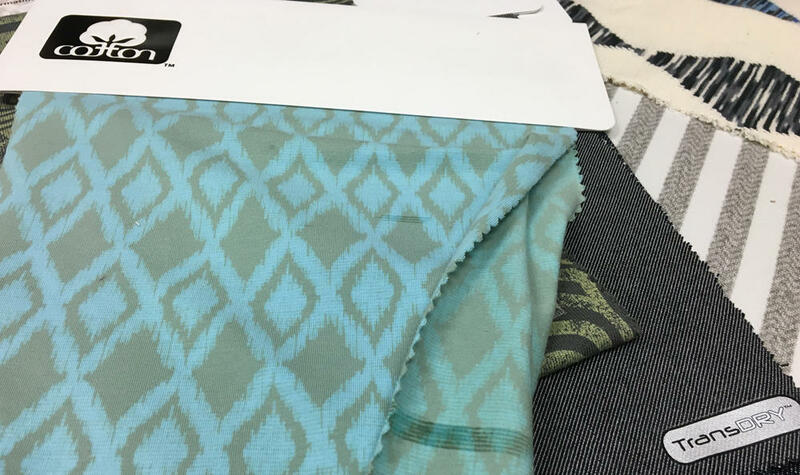 Cotton Inc. is hoping its TransDRY fabric will catch on with yoga pants designers. That would help increase demand for cotton. Meanwhile, cotton farmers like Dunlow have reasons for optimism as well. This year’s crop is shaping up to be better than average. And Dunlow said he’s in talks with cotton lobbyists and sympathetic lawmakers who think Congress could put cotton back into Title I of the 2018 Farm Bill. That’s about the same time economists expect China to deplete its cotton reserves. Correction: Mary Ankeny's name was misspelled in an earlier version of this story. The article has been updated. Made In North Carolina: The American Giant "Hoodie"
Part of President Donald Trump’s appeal is his pledge to bring jobs back to America. There’s a San Francisco apparel manufacturer who has tried his luck both ways – manufacturing abroad and in the US. Today, American Giant has found success in making sure every inch of its casual line of clothing is made in America. And that means it's also made in the Carolinas.